Find hotel near Sri Krishna Pranami Templ ..
Popularly known as the Khijada Mandir, this temple dedicated to Lord Krishna dates by to 1630. The construction of the temple was initiated by Nijanand Swami Shri Devchandreji the former Achraya of Shri Krishna Pranami Sampradaya. 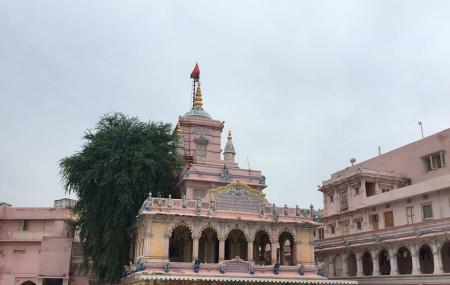 Originally what served as a site for gardens was chosen by Swami Shri Devchandreji as the site of the temple. According to the story, he spilt a small twig of Khijada tree into two and those grew up to be two separate trees, which gives the temple its name of Khijada. You can still observe these trees near the main shrine of the temple. Spend some time replete of tranquility on your trip to Bhuj. How popular is Sri Krishna Pranami Temple? People normally club together Ranjitsagar Dam and Lakhota Museum while planning their visit to Sri Krishna Pranami Temple.